Why do I have a Warning Level? I have had this on my account since I started using Tulpa.info. I noticed I'm the only one who had this, even my Tulpa Ranger doesn't have it and he was accidentally auto banned twice! Did I do something that bothered people? If so, I want to know so I don't do it again. 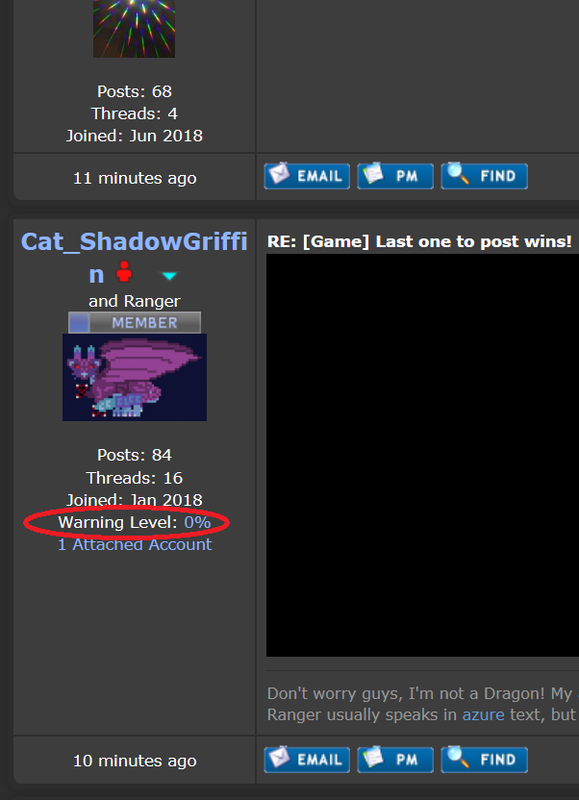 RE: Why do I have a Warning Level? Everyone has a warning level, you just only get to see your own. That shows 0%, indicating that you have not done anything wrong. (09-03-2018, 09:58 PM)Srn347 Wrote: Everyone has a warning level, you just only get to see your own. That shows 0%, indicating that you have not done anything wrong.